It's a holiday, folks, so this is just a brief note to let you know that JK Rowling's series about a hirsute ceramics worker will soon be available in Japanese. The Japanese editions will be slightly different from the existing American, English, French, Italian, German and Spanish editions. In order to display the Japanese characters correctly, the new ebooks will released as Epub3 files. And from the press release it sounds like the Japanese editions will also be lacking the pictures found in the other editions. The eBook editions of J.K. Rowling's bestselling Harry Potter stories will be available for the first time in Japanese when the Pottermore Shop (Shop.Pottermore.com/ja_JP), the exclusive retailer of Harry Potter eBooks, launches in Japanese later this summer. Pottermore, partnered by Sony, also features an exciting, free-to-use online experience built around the Harry Potter stories and features new content from J.K. Rowling. A Japanese version of this will be launched at a date still to be announced. The Japanese editions of the Harry Potter eBooks will be published in EPUB3 format and can be read on any EPUB3 compatible device or reading service, with Japanese font enabled. This will allow them to be downloaded for personal use on a range of devices and platforms, including personal computers, eReaders, tablets and mobile phones. The Harry Potter books have constituted the most successful book series of all time. Each of the seven books has broken sales records, with the series to date having sold approximately 450 million copies worldwide, been distributed in over 200 territories and translated into 73 languages, as well as being turned into blockbuster films. It was recently announced that a Harry Potter theme park would open in Osaka in 2014. 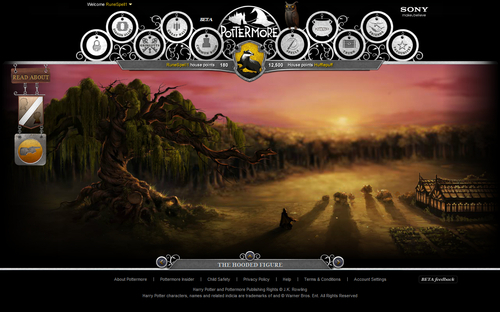 Pottermore is a free-to-use website partnered by Sony that can be enjoyed alongside the Harry Potter books. It is the only place to read exclusive new Harry Potter content by J.K. Rowling, and is also the exclusive home of the Harry Potter eBooks. The seven eBooks of the Harry Potter series will be published in Japanese in EPUB3 format. The price will be available at the time of launch. Each of the eBooks is unabridged and text only, without enhancement. The eBooks are published in partnership with J.K. Rowling's print publisher in Japan, Say-zan-sha Publications. For help and guidance when purchasing the Harry Potter eBooks, please visit the help section of shop.pottermore.com in Japanese once available. Payment options in the Pottermore shop include JCB, American Express, Visa and Mastercard Credit and Debit cards. The eBooks are available for personal use and by both parents, and children under 18 years old. The Pottermore Shop personalises eBooks with a combination of watermarking techniques to protect copyright. The Pottermore Shop includes an instant Gifting option so that friends and family can send Harry Potter eBooks as presents at the press of a button. The Pottermore management team is headed by Chief Executive Officer Charlie Redmayne and Chief Technical Officer Julian Thomas.